← Quick Tip: How to Change your Google Voice Number? Google Voice is still in private beta and you can only get a number if you have been invited or you already have a number from when it was GrandCentral like I did. We just recently talked about how to change your Google Voice number. But for those feeling left out but enthralled by the idea of having a virtual number – there is hope. Today. 3Jam is a company that so far offered services around SMS messaging is now expanding into offering telephony services – in direct competition with Google Voice. 3Jam squarely tackles all the features offered by Google Voice and offers some more. The ability to take phone calls on IM or Skype is excellent as it makes sense if you are already on a computer. Plus, Google is still working out number portability whereas 3Jam already offers it. So is 3Jam totally better than Google Voice? Well, not quite. 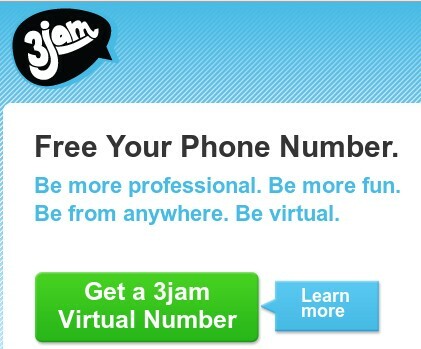 While most features in Google Voice are Free, 3Jam plans starts at $5/month. Plus, 3Jam lacks call filtering options that Google Voice offers. But, I think 3Jam has a good start in this area and even a behemoth like Google needs a little competition to keep them on their toes. 3Jam looks promising in that aspect. If you need a Google Voice like functionality today and can’t wait for Google to decide to offer up a number, 3Jam is definitely worth a shot. It’s cheap enough like MagicJack voip to safely giving it a try without putting a hole in your wallet. Give me a shout if you try the 3Jam service!